The day was Sunday, March 20, 2005, and Mike “Buga” Bugarewicz still remembers it like it was yesterday. He sat on the couch in his college apartment at Penn State University watching the FOX television broadcast of the Monster Energy NASCAR Cup Series race from Atlanta Motor Speedway when Carl Edwards edged Jimmie Johnson by .028 of a second in a classic side-by-side NASCAR finish. At the time, Bugarewicz was a graduate student studying mechanical engineering and doing research for the Navy through Applied Research Laboratories. When he wasn’t at school, he would spend his weekends working on and racing his own Street Stock and Late Model racecars. He also helped a friend compete on the NASCAR Whelen Modified Tour. The research program at school was rewarding, but Bugarewicz was getting the itch to do more in life. He’d grown up in Lehighton, Pennsylvania, playing on the high school football, wrestling and track-and-field teams. He also spent a lot of time watching his father race at Mahoning Valley (Pa.) Speedway and working on cars at his father’s business long before he even owned a driver’s license. Engineering was going to be his career after graduation, but racing was his passion. It was time to do something. The thrilling Atlanta victory not only launched Edwards’ career, it pushed Bugarewicz to embark on a path that led him to one of the highest-profile jobs in his profession – crew chief for Stewart-Haas Racing (SHR) and driver Tony Stewart in his final NASCAR season. After guiding Stewart to a victory at Sonoma (Calif.) Raceway in June 2016 and a berth in the NASCAR Playoffs in his first season as a crew chief, Bugarewicz oversaw the No. 14 team’s transition to driver Clint Bowyer and a new manufacturer in Ford in 2017. It all started with a race broadcast. On a whim, Bugarewicz drove to Charlotte in October, knocked on doors at several race shops and passed out resumes in hopes of getting into the sport. A few weeks after returning home, job offers arrived over the phone. He loaded all his possessions and drove to North Carolina to begin his NASCAR life. Bugarewicz started at Roush-Fenway Racing in December 2005, playing an engineering role across all of its NASCAR programs during the 2006 season. He worked with Danny O’Quinn in the NASCAR Xfinity Series while also working with the NASCAR Cup Series teams and part-time NASCAR Camping World Truck Series effort. From 2007 through 2009, Bugarewicz worked with David Ragan in the NASCAR Cup Series. 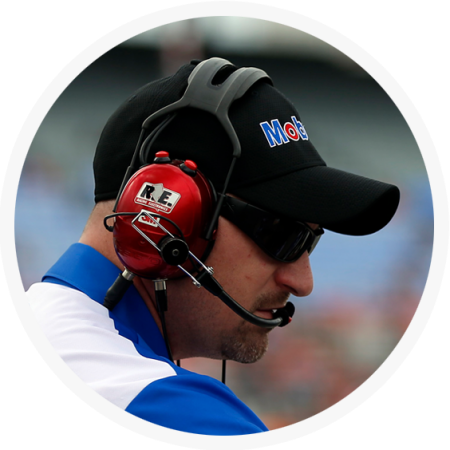 In 2010, he stayed within the Roush family and worked on the No. 98 NASCAR Cup Series team with Paul Menard as part of the team’s alliance with Richard Petty Motorsports. Roush moved Bugarewicz to the No. 17 NASCAR Cup Series team in 2011 where his race-engineering skills aided Matt Kenseth. Kenseth visited victory lane six times over the next two seasons, posting top-10 finishes in the season-ending standings. Rookie driver Ricky Stenhouse Jr. took over for Kenseth in the No. 17 in 2013, and at roughly the same time Bugarewicz starting seriously thinking of expanding his horizons. With limited opportunities at Roush, Bugarewicz took Rodney Childers’ offer to join him and driver Kevin Harvick as the lead race engineer for the No. 4 team at SHR. Under Childers’ guidance and with Harvick’s abilities, the team dominated the 2014 season, winning five races and capturing the NASCAR Cup Series championship. The team nearly repeated the feat in 2015, winning three races and finishing second in the title chase. For Bugarewicz, the lessons learned at SHR involve more than just statistics. They include picking the brain of SHR’s vice president of competition Greg Zipadelli, who owns two championships and 34 wins as a NASCAR Cup Series crew chief dating back to 1999. Bugarewicz points out that these specialists are still human beings. Beyond his years of higher education and the wisdom garnered from NASCAR peers, Bugarewicz said the principles ingrained in him by his parents and grandparents have had the greatest impact on his life. Becoming the crew chief for a future NASCAR Hall of Famer is a daunting task. To do it as a rookie crew chief in that driver’s final NASCAR season added another degree of difficulty. A preseason injury to the first-ballot Hall of Famer made the endeavor even more challenging, as interim drivers were needed for the season’s first eight races. Bugarewicz persevered and found solutions. The work ethic and determination honed in his Pennsylvania upbringing prepared him for all of the above when just days before the start of the 2016 season, Stewart sustained a back injury in an all-terrain vehicle accident. A burst fracture of the L1 vertebra kept Stewart out of what would have been his final Daytona 500 and the ensuing seven races. In his place during this period were Brian Vickers and Ty Dillon, who split time in the No. 14 machine until Stewart’s return April 24 at Richmond (Va.) International Raceway. Bugarewicz deftly managed the situation and upon getting Stewart back behind the wheel of the No. 14, helped the three-time NASCAR Cup Series champion earn five top-five and eight top-10 finishes, one of which was a win at Sonoma thanks to some sharp pit strategy by Bugarewicz and tenacious driving by Stewart. It was the 49th and final victory of Stewart’s illustrious NASCAR career and it propelled Stewart into the NASCAR Playoffs where he finished 15th, just 11 points shy of advancing to the Round of 12. Bugarewicz, who was the only rookie crew chief in the 2016 playoffs, turned his attention to Bowyer in 2017, whose eight career victories and second-place finish in the 2012 playoffs serve as a testament to his driving abilities. In their first year together, Bugarewicz and Bowyer scored three second-place finishes along with six top-fives and 13 top-10s. When those expectations are realized, the television announcers who provided the motivation to send a certain Pennsylvanian to North Carolina in search of a NASCAR career will likely spend a great deal of their time talking about the resurgent Bowyer and his third-year crew chief Mike Bugarewicz.